Dollhouse Decorating! 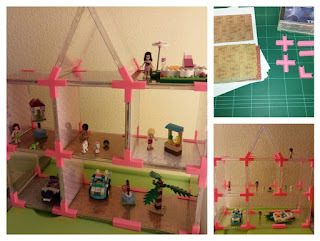 : A fun way to build a quick dollhouse out of CD cases and 3D printed connector pieces! I just saw this on Thingiverse, and thought some of you might like it! It's a clever idea to use old CD cases with 3D printed connectors... no gluing required! I also like that you can easily "re-wallpaper" or "re-floor" the house. (You can see some of our free printable doll house wallpaper here or some of our free printable dollhouse flooring here.) Of course not everyone has a 3D printer yet, but they are getting more common so you might be able to find someone close to you to print the connector pieces (this maker made the files available at no cost)... Be sure to check out the 2 videos... you can even make a quick studio room. Have fun! Again, this house is NOT my work, I am simply passing it along because I think you all might like it! Select the picture to be taken directly to their plans, and be sure to watch the videos!